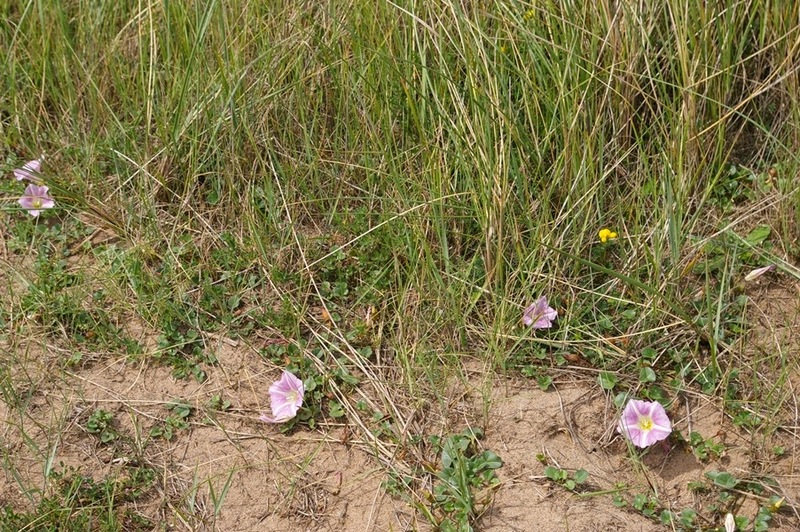 Sea Bindweed in classic habitat at the edge of sand dunes. I only know of one person who encourages bindweed in her garden, but she is rich enough to do what she pleases; the rest of us dread it. But set the fear and loathing aside and look at it objectively, if you can, and appreciate the real beauty of the flowers, with their perfect trumpets and finely furled buds. If, as gardeners say, they were rare and difficult to grow, we would lust after them, valuing them as we do morning-glories, Ipomoea. 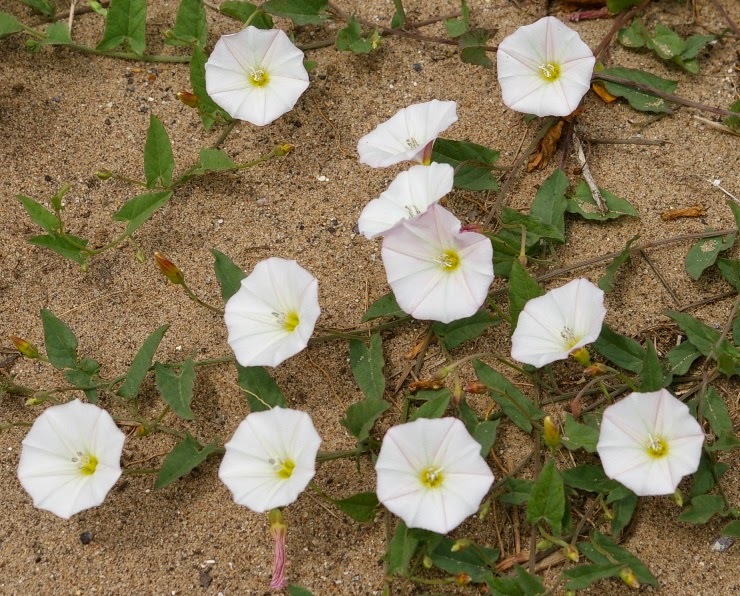 Yesterday I visited Spurn Head, the strange narrow spit of land that protrudes from the easternmost corner of the East Riding of Yorkshire into the Humber estuary, and found three species of bindweed growing in the sand dunes; the two common, nuisance-causing species Hedge Bindweed Calystegia sepium and Field Bindweed Convolvulus arvensis, and the much more refined and interesting Sea Bindweed Calystegia maritima. 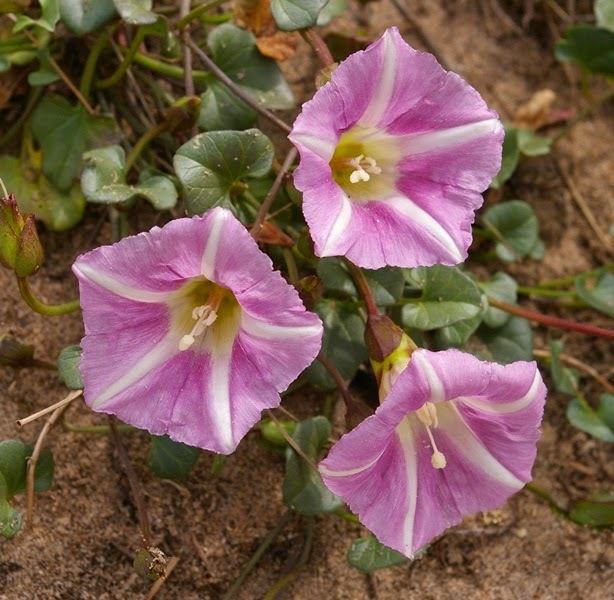 This is a strictly coastal plant, usually growing in sparsely vegetated sand dunes, though apparently it can occur in shingle too, usually with prostrate stems, small fleshy leaves and pink-and-white flowers. No doubt the rhizomes run through the dunes, but it doesn't seem to be an aggressive plant. 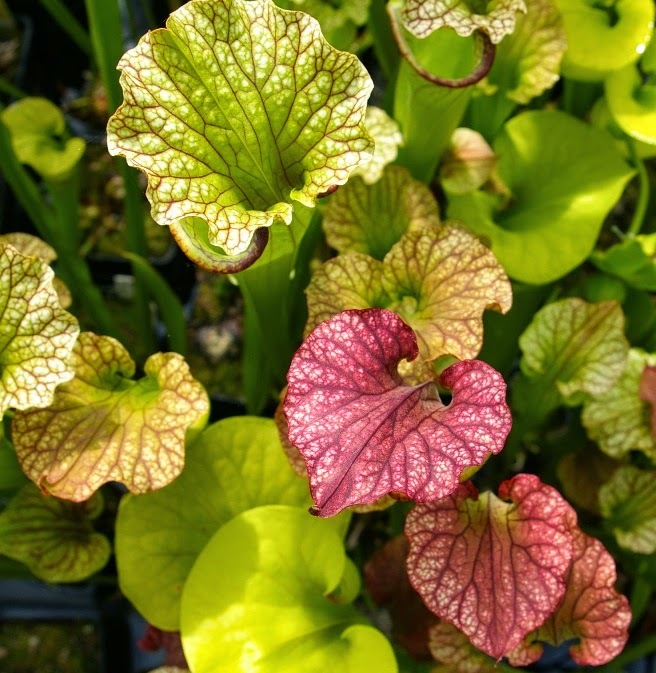 I've never seen it in cultivation - probably because of the generic reputation but I wonder if its maritime distribution is due to a degree of tenderness - after all, Convoluvulaceae is very largely a tropical family, with few temperate outliers. 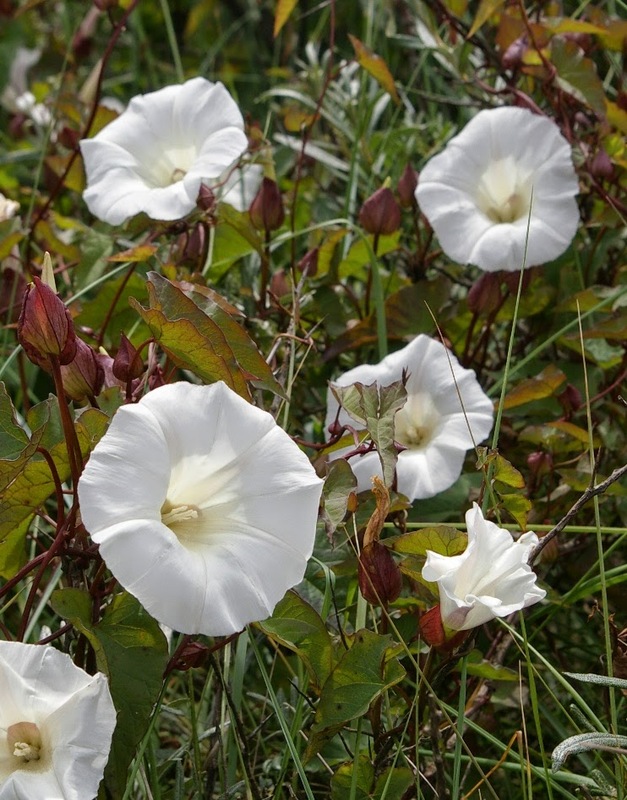 The familiar white trumpets of the dreaded Hedge Bindweeed, Calystegia sepium, but here in the dunes the plant had taken on a rich red tinge that set off the flowers very well. A pallid form of Field Bindweeed Convolvulus arvensis, another devil to be avoided at all costs in the garden, but actually very pretty. For those who may look at their bindweeds before trying to eradicate them, Calystegia is most easily distinguished from Convolvulus by the pair of bracteoles that envelop the base of the flower, concealing the calyx below them: they are clearly visible in the image of C. sepium. Convolvulus lacks the bracteoles, and (usually) has blunt calyx lobes and a linear stigma, while Ipomoea has pointed calyx lobes and a globose stigma (according to C. Stace, Flora of the British Isles, 2010). The weekend started very well with the announcement in The Queen's Birthday Honours that Roy Lancaster (left, with Robert Vernon of Bluebell Nurseries) has been appointed CBE 'for services to horticulture and charity' - a truly well-deserved honour in recognition of a lifetime's devotion to the promotion of gardening and plantsmanship. On Saturday afternoon I gatecrashed (with permission!) 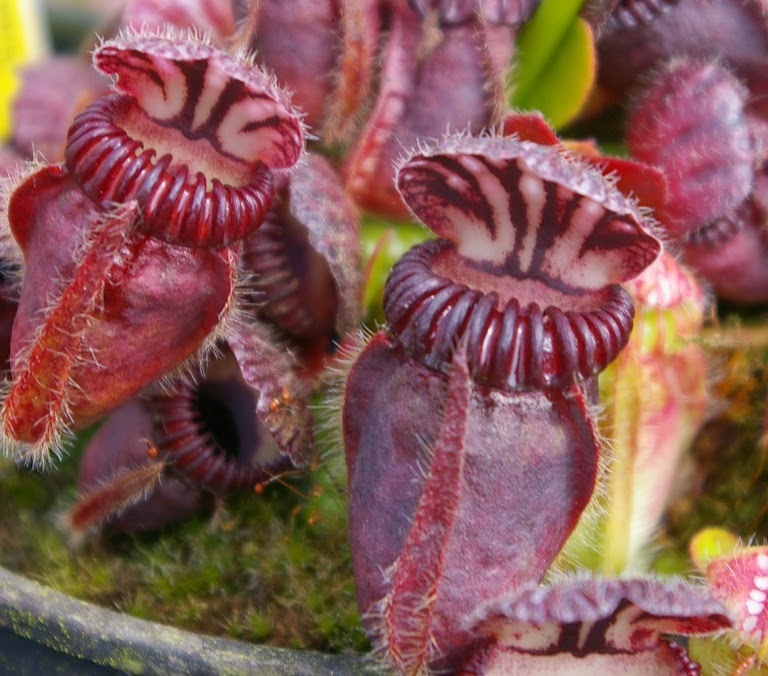 an open day for Carnivorous Plant Society members held by a friend of a friend, Stephen Morley. 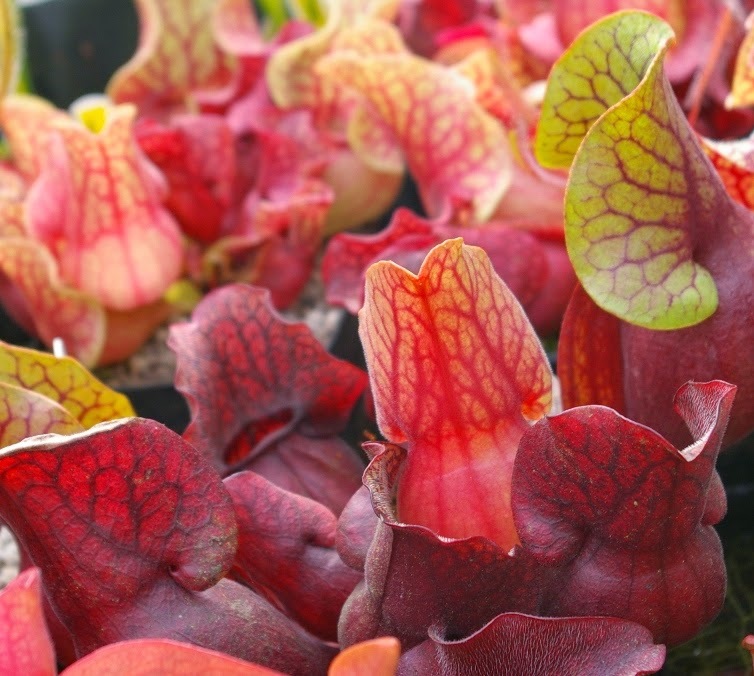 A diversity of colours of 'lids' in his Sarracenia collection. 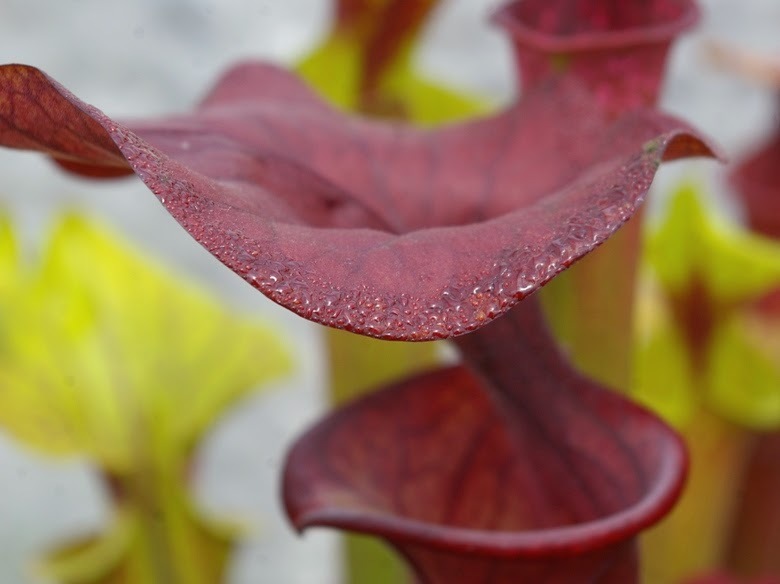 The lure: nectar secreted around the rim of the lid of a Sarracenia pitcher attracts insects to the trap. Cephalotus follicularis 'Eden Black' - an Australian pitcher plant, totally unrelated to the Sarraceniaceae. 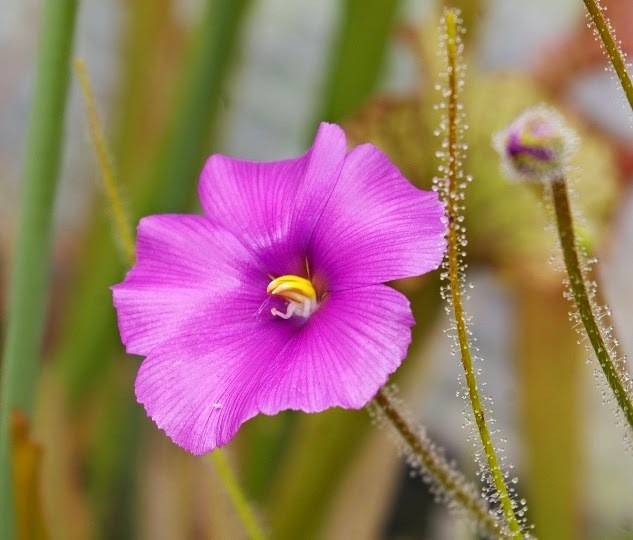 The difficult to grow Byblis gigantea, a sundew-relative from Western Australia. 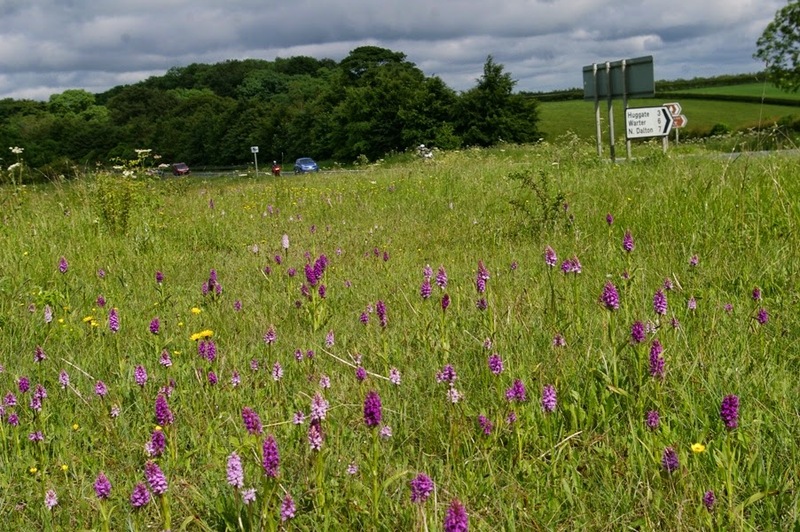 Returning home on the A166 I was astonished to see a wide verge covered in orchids and managed to find a place to stop. 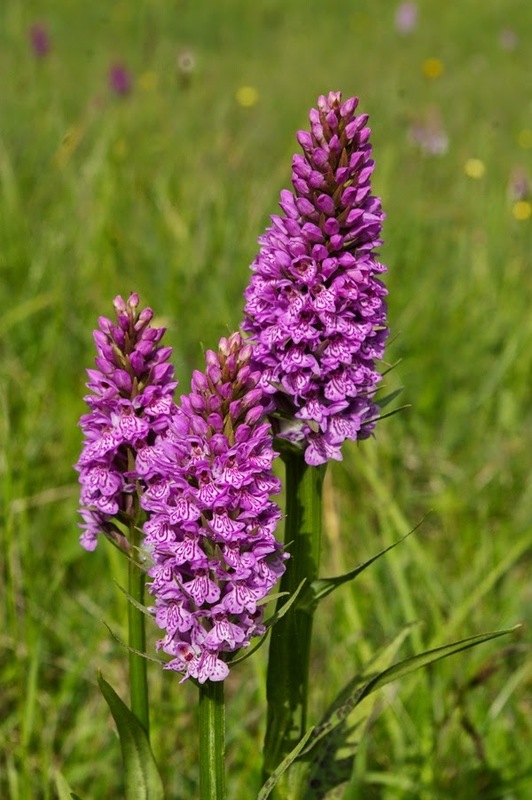 They are a mixture of Dactylorhiza praetermissa (dark purple), D. fuchsii (light pink) and their hybrid D. x grandis. A handsome group of Dactylorhiza x grandis. Sadly many plants in this colony have the disease Cladosporium orchidis, which causes leaf necrosis and untimely die-back. For more information see the Scottish Rock Garden Club website. 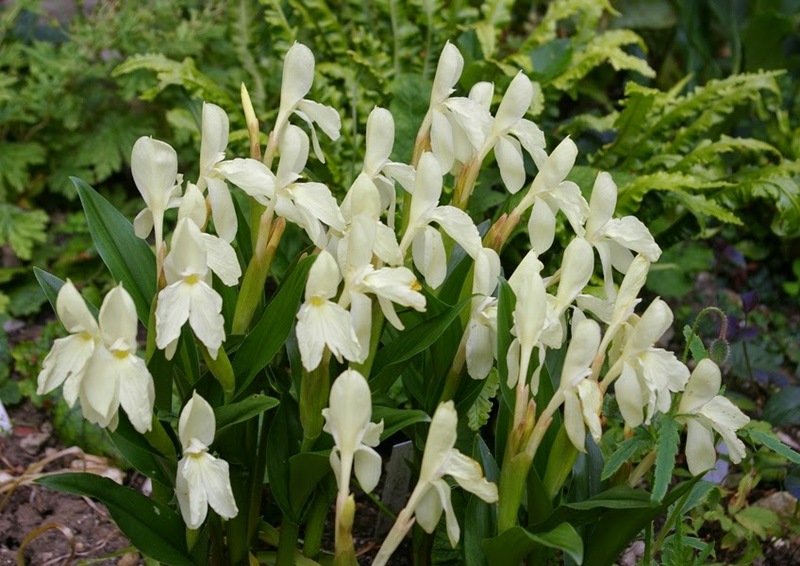 At home: Roscoea humeana 'Longacre Sunrise' has been at its best this weekend. Anthemis 'Tinpenny Sparkle' is just getting going. 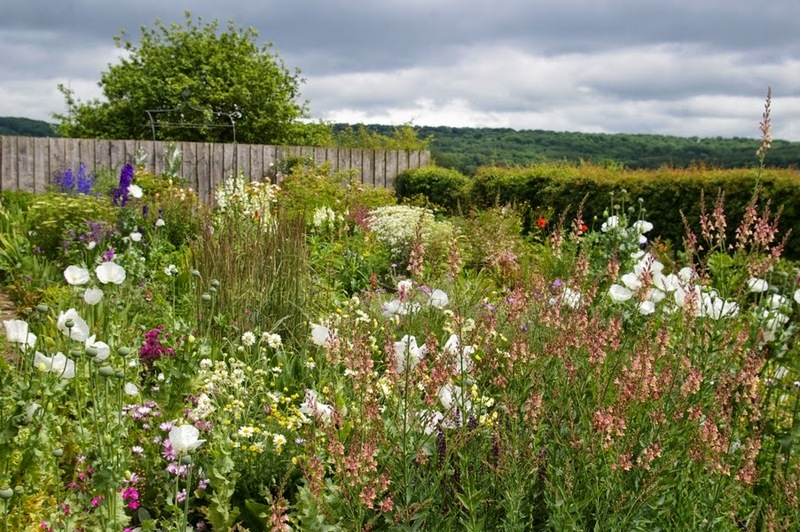 A view across the main border, with Linaria 'Peachy' in the foreground. 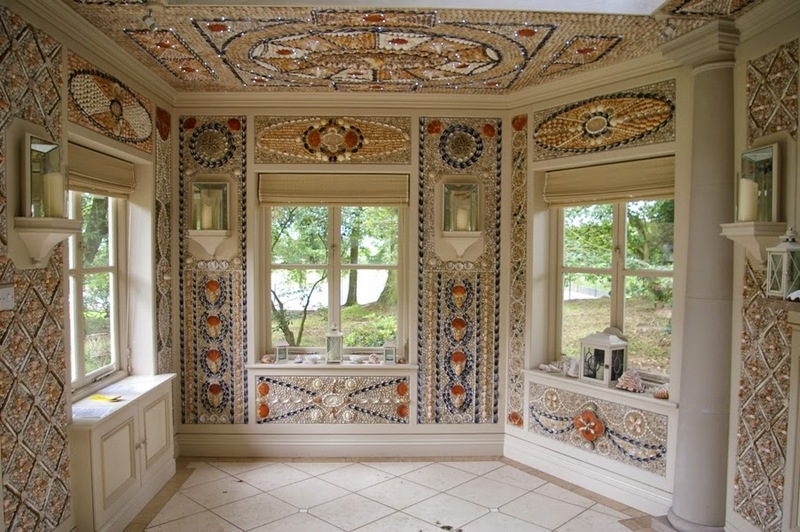 The garden at Terrington House was open for NGS today: the garden is blandly pleasant, but the Shell House (completed 2008) is a delight. 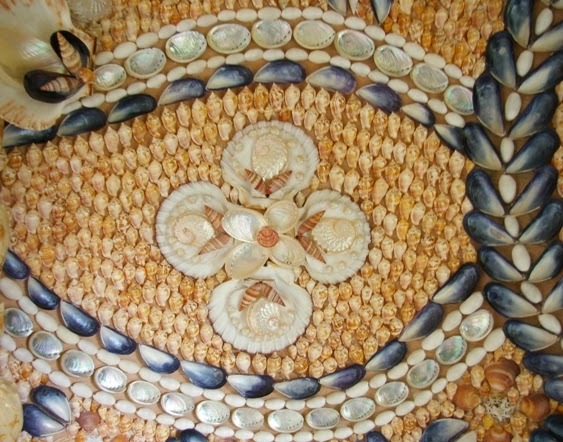 A detail of the shells used to create the patterns over the walls and ceiling - a tremendous piece of work by the Fenwick family. I remain captivated by the beauty of the white opium poppies I grow, descended from the seed obtained from a baker by Pam Schwerdt and Sibylle Kreutzberger to grow at Sissinghurst Castle (as described in my entry for 31 December 2011, when it was named my Plant of the Year 2011). This is a selection of images from this garden taken in the past week, needing no captions I think. An elegance of pure white foxgloves, also self-sown. 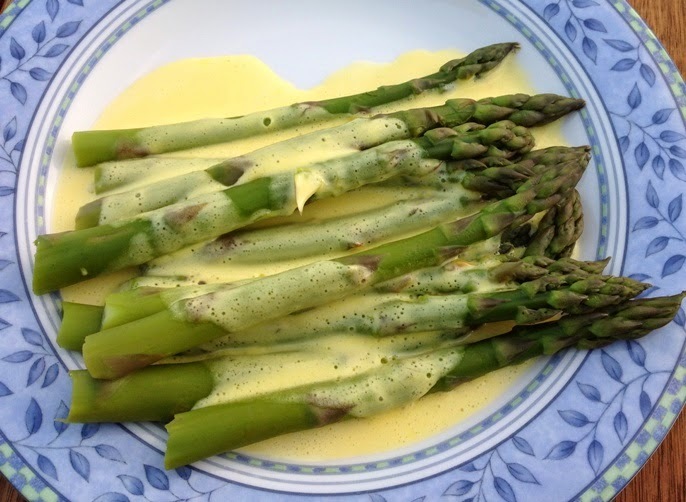 My predecessor wisely had no purple ones here. I'm very happy with how the drive border is looking at the moment. 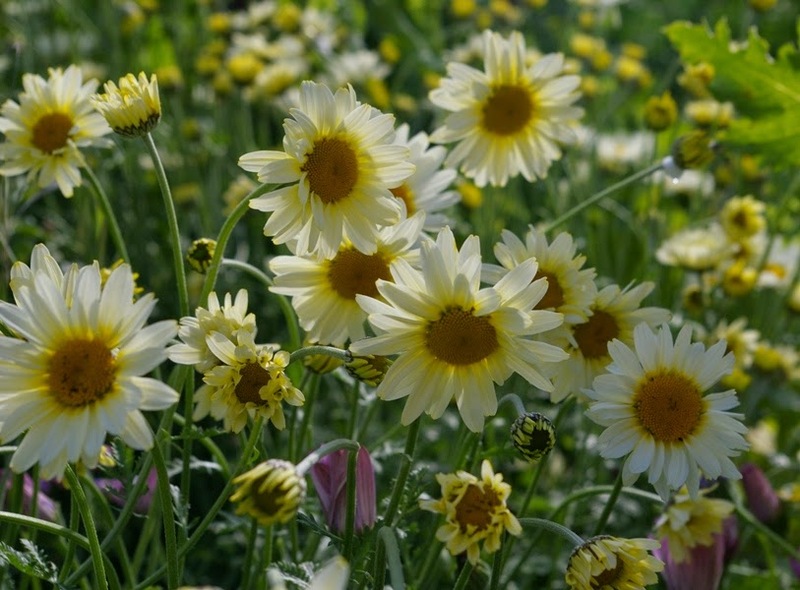 Symphytum 'Axminster Gold' forming a froth with spontaneous Oxeye Daisies, Leucanthemum vulgare. The main border just outside my study - flowers and foliage nicely combined. Iris 'Petit Tigre' - a purchase from Cayeux last Chelsea. More curious than beautiful. The pale form of Dracunculus vulgaris - at least as rude as the normal form, but mercifully now past the stinking phase.